In the first few minutes after we meet the main character in Snitch, he utters the line, “I’ve been rolling the dice all my life.” Ugh. Normally, an eye-rolling opening such as this does not bode well for the rest of the film. Happily, though, Snitch is able to squeeze a nice bit of human drama into an otherwise standard Hollywood whitewash of a complex issue. Snitch is, as they say, “based on true events” that occurred when a man named James Settembrino went undercover for the DEA in exchange for leniency toward his son’s sentence after a first-time drug offense. The film version centers on construction company owner John Mathews (Dwayne Johnson), a successful businessman with a new wife and child. When his estranged son from a previous marriage agrees to hold a package of drugs for a dealer, all involved quickly learn harsh realities about mandatory sentencing. John’s pleas to the federal prosecutor (Susan Sarandon) go for naught, so he offers to help the Feds nab more major players in the drug trade. 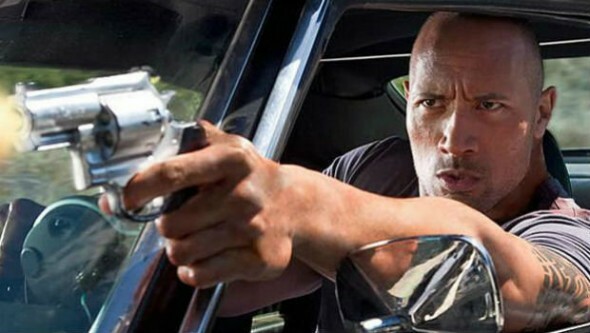 Johnson has made his mark as a action star, which might explain pairing him with director Ric Roman Waugh, a longtime stunt coordinator still fairly new to helming feature films. There certainly are action sequences, but Snitch works best when Waugh dials it down to focus on smaller moments. Particularly effective is a side plot involving John’s employee Daniel (Jon Bernthal of The Waking Dead). Daniel is an ex-con trying to distance himself from his drug-running past, but John needs him for an introduction to a local dealer named Malik (a menacingly good Michael Kenneth Williams). Waugh wrings palpable tension from John’s foray into the drug world, and Bernthal skillfully articulates Daniel’s internal struggle, giving the film the emotional pull that should have come from John and his family. Those scenes, flush with overwrought writing and uninspired acting, barely rise above the level of a daytime soap. The problem really isn’t Johnson, who pulls off his best performance to date. Wisely, his massive physique is kept under wraps as much as possible, in an effort to paint John as little less Superman and a little more common man. Unfortunately, the superhero element eventually wins out, and the film walks away from the moral ambiguities it was contemplating to instead deliver an over the top finale clearly designed to draw empty applause.